Biomimicry is the practice of learning FROM nature, in order to innovate, and in particular to design more sustainable products, processes and systems. Cities that provide ecosystem services. There is so much to learn from the natural world. Find out how far this field has come since it emerged as a formal profession only a decade ago. We have previously run field-guide biomimicry training for guides at Singita Sabi Sands, Tswalu, as well as within EcoTraining. Field Guides are in the perfect position to share the genius and wisdom of the natural world - particularly through the lens of biomimicry. How can you add the fascinating field of biomimicry to your field guiding? This course introduces you to the why, what and how of biomimicry, and provides you with tools and resources to continue to develop your biomimicry interpretation skills. You can also deepen your learning to become a Biomimicry Practitioner yourself. It all starts with this introductory workshop. This one-day course will be hosted at the Science Leadership Initiative Campus in Skukuza village, Kruger National Park. Cost: R945pp, includes tea/coffee, lunches, tuition, workbooks, game drive & walk. Accommodation is available at the venue for those who require it at an additional R150pp per night. Discounted rates are available for 2 or more guides from one organisation. 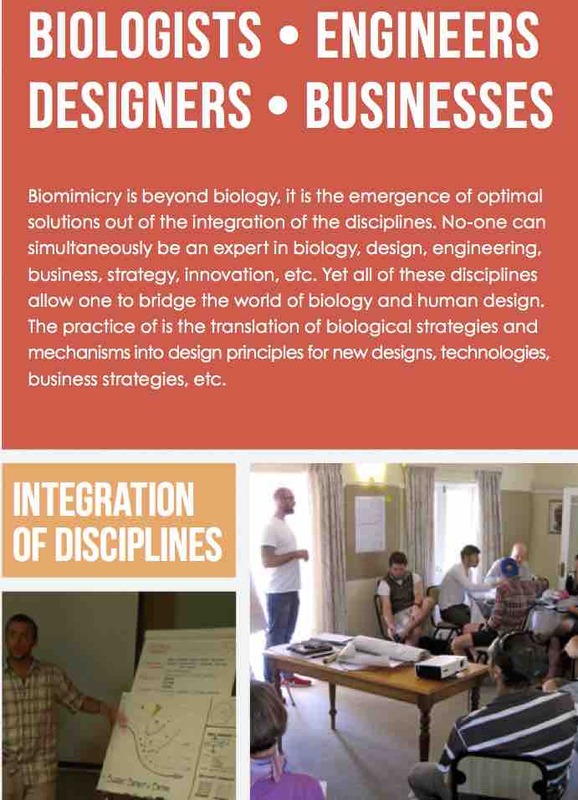 Learn and practice the Biology to Design and Challenge to Biology biomimicry methodologies. If you would like more in-depth training in biomimicry, then please ask us about our special Field Guide rate for the 5-day Biomimicry Immersion Workshop at the same venue from 8-12 October.